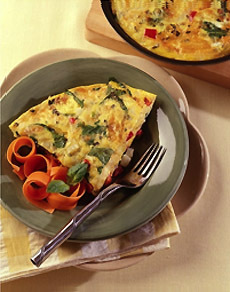 A classic Italian frittata (recipe below). Photo courtesy National Potato Board. Omelets and frittatas seem like leisurely brunch or lunch fare. But don’t hesitate to serve them for dinner. An hearty egg dish with a large salad is a tasty and nutritious meal at any time of the day. Vegetable fillings (see the list below) add variety, not to mention nutrients and fiber—and are one way to get vegetable-wary family members to eat more of them. What’s the difference between an omelet and a frittata? Omelet. With an omelet, the added ingredients are a filling, added to the beaten eggs as they set in the pan. As the omelet continues to cook, it is folded with a spatula into semi-circular or rectangular shape. Both can be made in the same frying pan or special omelet/frittata pan. Sautéed Vegetables: The list is more inclusive than exclusive: artichoke, bell pepper, cabbage, cauliflower, carrot, chard, eggplant, kale, mushroom (use the wild varieties for more flavor), onion/leek/green onion, potatoes (boiled/roasted), spinach, zucchini—heck, anything you have in the fridge. Add minced jalapeño or chili flakes if you like heat. Cheese: Some favorite cheeses work well: melting cheeses (Emmenthal/“Swiss,” mozzarella, Provolone; grating cheeses (Asiago, Grana Padano, Parmigiano Reggiano/Parmesan, Pecorino Romano); soft cheeses (goat cheese/chèvre). Meat: ham/prosciutto, roast chicken/turkey, salame, sausage. When you make chicken or ham, set some aside for the next night’s frittata. 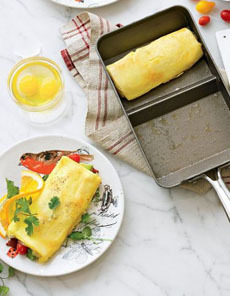 To make a rectangular omelet, pick up this special Nordicware omelet pan at Willliams-Sonoma. There’s also a microwave version. 1. PREHEAT. Preheat oven to 350°F. 2. SAUTÉ. In an 8” nonstick sauté pan, heat 1 tablespoon of the olive oil over medium heat. Add the potato and cook, turning often, until tender and golden, about 10 minutes. Season with salt and pepper. Remove the potato slices with a slotted spatula and set aside in a bowl. 3. FRY. Add 1 tablespoon oil to the same pan and fry the zucchini, turning once, until tender and slightly golden, about 4 minutes. Add the basil and season with salt and pepper. Using the slotted spatula, add the zucchini to the potatoes. 4. SAUTÉ. Add enough oil to the pan to total 2 tablespoons and return to medium heat. Add the onion and sauté until soft and tender, about 10 minutes. Remove with the slotted spatula and add to the potatoes. Add the bell pepper strips to the vegetable mixture. 5. BEAT. In a large bowl, beat the eggs until well blended, adding a little of the optional Parmesan. Add to the vegetables. Pour the mixture into an oiled baking dish. Bake at 350 degrees until set and golden, about 25 minutes. Cut in half and set aside half. Cut the remaining half into wedges and enjoy for dinner. Cover the other half and refrigerate for up to 2 days for another supper. If you’re not good at flipping a frittata or omelet, use your broiler to cook the top side. Place the pan in the broiler under a low flame. When the top is golden brown, it’s time to dig in. Treat yourself to this excellent egg cookbook. How many different types of eggs have you had? Check out our Egg Glossary. Find more egg recipes in our Eggs Section.